Organisms in this class bear a tip at one end of their outer membrane. This apical complex includes vesicles called rhoptries and micronemes, which open at the anterior of the cell. These secrete enzymes that allow the parasite to enter other cells. The tip is surrounded by a band of microtubules, called the polar ring. As the name indicates, Aconoidasida (from Greek: negative prefix a- = "lacking") lack a conoid, i.e. a funnel of rods used for myzocytosis, (they do have one only during the ookinete stage) in contrast to the class Conoidasida which have one throughout their life cycle. ↑ Mehlhorn H, Peters W, Haberkorn A (1980). 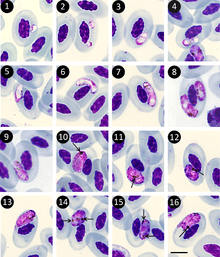 "The formation of kinetes and oocysts in Plasmodium gallinaceum and considerations on phylogenetic relationships between Haemosporidia, Piroplasmida, and other Coccidia". Protistologica. 16: 135–154. ISSN 0932-4739. "Aconoidasida". NCBI Taxonomy Browser. 422676.